King Aragorn Elessar The lands between the Misty Mountains and the Blue Mountains are named Eriador. In the north it is bordered by the frozen bay of Forochel and in the south by the White Mountains. Such natural defences have at times allowed the land to prosper, but it has not always been peaceful.For in the year 3320 of the Second Age, Elendil established the Northern kingdom of Numenorians - Arnor. Elendil built many settlements here – Amnnuminas the great capital of Arnor, and fortresses such as Fornost, Amon Sul and Tarbad. There was also the high tower of Elostirion in which one of the great treasures of Middle-earth was kept the great Palantir.. Sauron hated the Dúnedain Numenorians and sought to destroy them. In the war of the Last Alliance, the Dark Lord’s forces were defeated but leaders of the Alliance against him - Elendil and Gil-galad were killed in the fighting. Isildur - son of Elendil was himself the bane of the Dark Lord and it was he that took up the One Ring. When Elendil fell and the One Ring was lost, his son Valandil became king. After the Disaster of the Gladden Fields, Arnor began its slow decline. While Gondor rose in power, Arnor waned.After the death of its tenth king, Eärendur, in T.A. 861, Arnor was shaken by civil war between the three sons of Eärendur. The eldest son, Amlaith, claimed Kingship over all Arnor but was reduced to only ruling the region of Arthedain as his kingdom, while the other sons founded the kingdoms of Cardolan and Rhudaur. The former capital, Annúminas, became depopulated and fell into ruin. This marked the start of the decline of the Northern Dúnedain.The three kingdoms had frequent border skirmishes over boundary disputes, but the relationship of Arthedain and Cardolan remained relatively peaceful. However, Rhudaur was unfriendly towards the two other successor states, and took part in a bitter conflict with Cardolan over the tower of Amon Sûl and the palantír associated with the tower. Around T.A. 1300, an evil power, the Witch-king, arose in the mountains of the North East, where he founded Angmar. It was later revealed he was the leader of the Nazgûl.In 1974 the Witch-king destroyed Fornost and with it the last of Dunedain here. 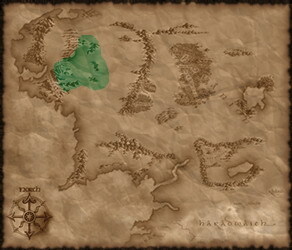 One year later Angmar was defeated by Gondor and Elves but northern Kingdom of Numenorians was lost. Only a part of dunedain leading by Aradart - descendant of Isildur survived. Most of Eriador people died in wars and in time of Great Plague, last of the Dúnedain. Although some still wander in the wilderness, to all intents and purposes, Eriador has been ever since a kingdom without a king, or at least a king who would show himself to the Shadow.But as the echoes of Sauron whisper in the world, the rallying cry has risen in the Free Lands. Aragorn II, son of Arathorn, is the last of the great Dúnedain and the burdened king of Eriador. Aragorn would seek to reforge not only the alliance of men and Elves, but also the kingdoms of Arnor reunited into a mighty whole, and perhaps even the shards of Narsil. Excellent heavy archers, capable of terrifying ambushes. Heavy pikemen, equipped with a shield and sword. Elite medium cavalry armed with a lance and sword. Heavy cavalry bodyguards, last of the legendary Dunedain. Strong light infantry, lacking in good defence. Peasants wielding farming tools and if lucky, wearing some armour. In times of war peasants are forced from their farms and drafted into militias. Light infantry armed with a small wooden shield and a sword. Light archer unit, equipped with a bow and a small knife. Good archers and the best Hobbit warriors available. Light archers equipped with a bow and sword. Versatile light spear cavalry with axes and small shields. Fast-moving, lightly armored horse archers. Boasts strong and flexible light infantry. The Green Dragon is a popular inn near Hobbiton. The Prancing Pony is a famous inn in Bree. Hole dwellings used by Hobbits.